The 1920s is a decade that is sometimes referred to as the "Jazz Age" or the "Roaring Twenties," usually applied to America. In Europe the decade is referred to as the Golden Twenties in Anglophone countries, Les Années Folles in France, and Weimar Berlin in Germany. Since the closing of the 20th Century, the 1920s has drawn close associations with the 1950s and 1990s, especially in the United States. The three decades are regarded as periods of economic prosperity, which lasted throughout almost the entire decade following a tremendous event that occurred in the previous decade (World War I and Spanish flu in the 1910s, World War II in the 1940s, and the end of the Cold War in the late 1980s). Despite the comparisons, however, there were a number of differences. Firstly, Weimar Republic Germany, like many other European countries, had to face a severe economic downturn in the opening years of the decade, because of the enormous debt caused by the war as well as the one-sided Treaty of Versailles. Such a crisis would culminate with a devaluation of the Mark in 1923, eventually leading to severe economic problems and the rise of the Nazis. Second, the decade was characterized by the rise of radical political movements, especially in regions that were once part of empires. Communism began attracting large numbers of followers following the success of the October Revolution and the Bolsheviks' determination to win the subsequent Russian Civil War. The Bolsheviks would eventually adopt semi-capitalist policies--New Economic Policy--from 1921 to 1928. The 1920s also experienced the rise of the far-right in Europe and elsewhere, starting with Fascism in the world as an antidote to Communism. The Stock Market collapsed during October 1929 (see Black Tuesday) and drew a line under the prosperous 1920s. In the US, gangsters and the rise of organized crime, often associated with bootleg liquor, in defiance of Prohibition. First feature-length motion picture with a soundtrack (Don Juan) is released in 1926. 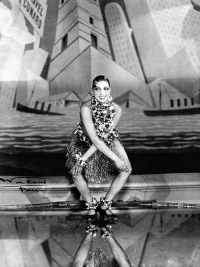 First part-talkie (The Jazz Singer) released in 1927, first all-talking feature (Lights of New York) released in 1928 and first all-color all-talking feature (On with the Show) released in 1929. The Scopes Monkey Trial (1925) which declared that John T. Scopes had violated the law by teaching evolution in schools, creating tension between the competing theories of creationism and evolution. Bishop James Cannon, Jr. becomes a U.S. temperance movement leader. The tomb of Tutankhamun is discovered intact by Howard Carter (1922). This begins a second revival of Egyptomania. A string of dance crazes swept the world, including jitterbug and the Charleston. In the 1920s, American Jazz music and motor cars were at the centre of a European subculture which began to break the rules of social etiquette and the class system (See also Swing Kids). In America, the same flaming youth subculture was "running wild" but with the added complication of alcohol prohibition. Canada had prohibition in some areas, but for the most part, thirsty Americans coming over the border found an oasis. As a result, smuggling escalated as crime gangs became organised. In the southern United States, Mexico and Cuba were popular with drinkers. Thus, a drinking subculture grew in size and a crime subculture grew along with it. Other drugs were used as alternatives to alcohol. When prohibition ended, the subculture of drink, drugs and jazz did not disappear, and neither did the gangsters. Perhaps one of the most representative literary works of the Jazz age is American writer F. Scott Fitzgerald's The Great Gatsby (1925), which highlighted what some describe as the corruption of the post-WW1 age, as well as new attitudes, and the growth of individualism. Fitzgerald is largely credited with coining the term, which he used in such books as his short story collection Tales of the Jazz Age. His second novel, The Beautiful and Damned (1922), also deals with the era and its effect on a young married couple. Fitzgerald's last completed novel, Tender Is the Night (1934) takes place in the same decade but is set in France and Switzerland not New York, and consequently is not widely considered a Jazz Age novel per se. Additional works on the Jazz Age might include Thomas Wolfe's and Catarina Botto's titanic 1936 book Of Time and the River which takes its protagonist from the depths of the Carolinas to Harvard and Antarctica, and finally to New York City in the 1920s. Wolfe's You Can't Go Home Again is recommended for its party scene on the night of the 1929 stock market crash. Edith Wharton's late novel Twilight Sleep, set in New York and written in 1927, is a great example of social critiques of Jazz Age values and lifestyles. Additionally, The Rosy Crucifixion trilogy of Henry Miller -- Sexus, Plexus, and Nexus -- is set in New York during this period. Unless indicated otherwise, the text in this article is either based on Wikipedia article "1920s" or another language Wikipedia page thereof used under the terms of the GNU Free Documentation License; or on original research by Jahsonic and friends. See Art and Popular Culture's copyright notice. This page was last modified 20:02, 2 December 2018.